So … I bought these Wild Beast Shipping Crates from 4Ground and I’m very impressed. They come flat packed in laser cut card form and could be pushed free with ease (although I’d recommend a craft knife, especially for the finer parts). the outer box cladding nicely covers up the join lines on the boxes so it makes for a really neat finish. 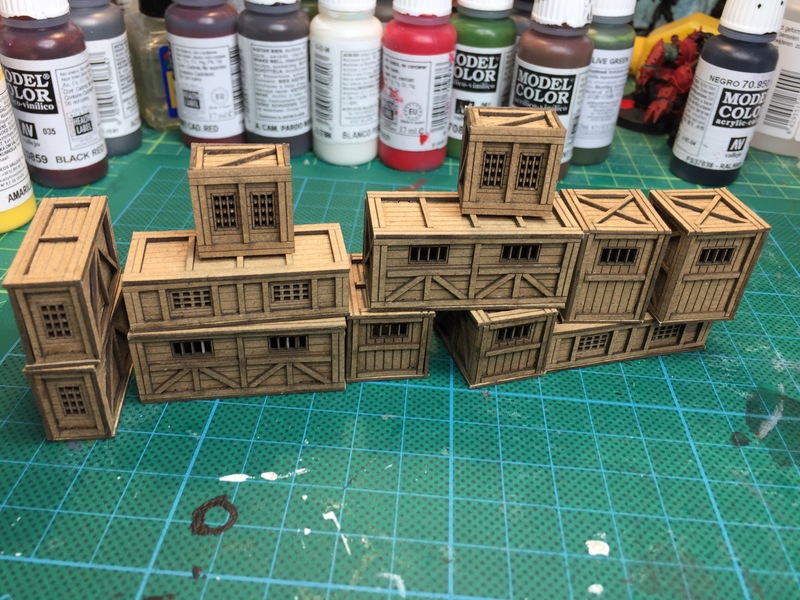 To build them I just used normal wood glue and an old brush to assemble them but a word or two of warning; firstly, make sure you assemble correctly, especially the tops and bottoms of the outer case of the boxes (the piece with the most supports go underneath. Secondly, the the order in which the instructions suggest assembling the outer case is not ideal, there is a better way which involves putting the pieces that exactly fit to the edges in order. Also worth mentioning that the top or bottom of a box is slightly different (the bottoms are more reinforced). This entry was posted in Terrain, Wargaming. Bookmark the permalink.